As you can see from our previous blog posts, AkroBins are so very useful to keep office, home, or garage organization. You can simply stack them up, nest them on top of each other when empty, arrange them in panel louvered hanging system, put them in shelves, or place them on dolly or cart when you need them to be mobile. Now what if you want to keep them – and the stored items – free from dust and safe from unauthorized hands? 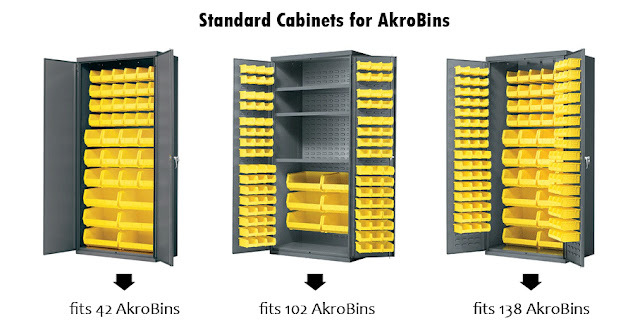 You should start looking at the Standard Cabinets for AkroBins. There are three cabinets to offer. Each has different capacity of how many AkroBins it can hold. But all three have double-locking door protection, ensuring that the items kept inside are well protected from unauthorized use. They also have gray powder coat finish that is resistant to cuts and scratches and they’re made of strong, rugged 16-gauge welded steel. The first one is the Standard Cabinet holding up to 42 AkroBins. Depending on the size of the AkroBins you are to store, this cabinet can take up to 42 bins. The cabinet has flush doors with louvered panels on the back. The second – AkroBins standard cabinet holding up to 102 AkroBins – features louvered panels on the back wall and the doors, as seen in the picture below. The third cabinet has the ability to hold even more bins with 138 AkroBins. This also has louvered panels on the back wall and the doors. Which AkroBins cabinet is suitable for you? Practice good inventory management with AkroBins and our inventory labels.